As per Guilty, I also like that the histrionics - on both sides - are kept to a minimum. Not that there's anything wrong with that, Lord knows I loves me some bombast but it's nice to calm down once in a while. The song title officially ends in an exclamation point, but it lacks the urgency that a song so labeled ought to have. This got no airplay where I lived, and because Casey Kasem never counted it down (i.e., it never made American Top 40) I never heard it at all. I didn't buy the 45 at the time, nor did I get the Times Square soundtrack. I now have a promo 45 and the picture sleeve, and I think the LP is hiding in the album collection somewhere. I listened to "Help Me" for this post, and it didn't sound familiar at all. Many commenters on the YouTube video noted that the song was out of place on the soundtrack, but it did close the movie well. Marcy Levy did better work before and later. Her backing/duet vocal on Eric Clapton's "Promises" is sublime, and I think the combination pushes the song into another level (it is my favorite Eric Clapton solo single). Later, Levy changed her name to Marcella Detroit and teamed up with former Bananarama member Siobhan Fahey in a duo named Shakespears Sister (the misspelling and lack of apostrophe is correct), which had the outstanding hit song "Stay," a Top 5 hit in Billboard, Cash Box, and Radio & Records in 1992. You can hear some of the really high notes Levy/Detroit would hit in "Stay" in the later part of "Help Me." If there was ever a 20 Feet from Stardom II, she'd be a great candidate to appear. Technically, the lead single from Times Square was "Rock Hard" by Suzi Quatro (Dreamland DL 104), released in late August 1980; its picture sleeve mentioned that it was from the soundtrack album. The song failed to chart. A third single was released later from Times Square: "I Wanna Be Sedated" by the Ramones (RSO RS 1055), duly licensed from Sire Records, and today probably one of their two most famous songs along with "Blitzkrieg Bop." But by then, the movie and the soundtrack album were old news. The Times Square two-disc set actually serves as a decent cross-licensed sampler of college-radio and new wave music of the era; "Talk of the Town" by the Pretenders made its U.S. debut on the album, for example, and it had previously unreleased tracks by Joe Jackson and XTC. But it has never been on CD, probably because it would be a licensing nightmare without the guarantee of enough sales to cover the costs. Even as it was, the vinyl 2-LP set didn't contain "Dangerous Type" by the Cars, which is heard in the film. In the October 25, 1980 Top Single Picks column in Billboard, "Help Me!" was one of nine (yes, nine) new releases predicted to make the top 30: "Levy, who's backed Eric Clapton on many of his albums and tours and Gibb play off each other's vocals in this slick pop song from the 'Times Square' soundtrack. The duo harmonize exceptionally well maximizing the song's lyrical impact." Cash Box listed it as one of its Hits - Out of the Box in its November 1, 1980 issue. Also on November 1, Record World had "Help Me!" as a Page 1 single: "Warm, energetic, pinpoint harmony vocals overwhelm on this bold pop-rocker from the 'Times Square' soundtrack LP. Ideal for pop-A/C audiences." As implied earlier, "Help Me!" failed to generate much excitement at radio or retail: It peaked #50 in the Billboard Hot 100, #65 in Cashbox and #64 in Record World. The soundtrack album didn't do all that well, either, peaking at #37 in Billboard, #44 in Record World, and #53 in Cash Box. Based on when the single was reviewed, "Help Me!" wasn't released until October 1980. Issued on RSO RS 1047, it does have a picture sleeve! The B-side is an instrumental version. The vocal version is shorter than the instrumental -- a listed 3:26 vs. 3:55. The Richmond 45s are on the new silver RSO label. Bestway copies exist on both the tan and silver labels. The Presswell and Compton are on the old tan label. I suspect that RSO distributed the new 45 labels on an as-needed basis; they allowed plants to use up the old stock before supplying the new. White-label promo copies have the vocal version on both sides, mono/stereo. The time is listed as 3:26, the same as on stock copies. The promos I've seen come from CBS Terre Haute (73), but I've seen no stock copies from there. pablo fanques, Hadean75, cut to the chase and 2 others like this. -- a listed 3:26 vs. 3:55. Geez, Mr. Stigwood must have put all the money he made on Grease and Fever back into his string of huge failures...Moment By Moment, Times Square, Stayin’ Alive, Pepper and I’m sure I’m forgetting one or two more. A wonder he didn’t die broke! I was always sorry RSO went under. It didn't go under. Polygram absorbed RSO Records into their conglomerate like they did Casablanca Records. Jrr, Hadean75 and Jarleboy like this. I knew that, but I guess this gives me an excuse to include Casablanca....was sad to see the physical labels go away as they were so iconic to me, a big part of my childhood (hmm, that seems sad now but I guess at least those are still around, unlike some girlfriends of the day)! The music was changing big time as well during that time, so that’s probably part of it. Hadean75, Grant and Jarleboy like this. The last RSO label I have is the one with the silver background. It was "Far From Over" by Frank Stallone from 1983, or a future Bee Gees single from that same year. The last Casablanca single I have is 1983's "Flashdance...What A Feeling!" by Irene Cara. Polygram kept the Casablanca label active until 1985. Cameo's "Single Life" CD was the last title I recall released on it. Larry Blackmon's Atlanta Artists label was under its umbrella. Yup...like you I have both the soundtrack to Stayin’ Alive (pretty painful listen) and the outstanding sounding Flashdance soundtrack. Boy is that crankable on vinyl, and ironically among the first cds I bought. It was a very expensive import and I was the only one I knew that had a copy. I didn’t care for the silver RSO label. I had actually read in that Casablanca bio that Flashdance was the last album to use the Casablanca label. Was that silver RSO label only used for the one project (Stayin’ Alive album and any singles)? Was that silver RSO label only used for the one project (Stayin’ Alive album and any singles)? pablo fanques, Jrr and Jarleboy like this. The first record I saw with the silver RSO label was 1979's promo-only Select Disco Cuts from "Spirits Having Flown" 12-inch single. It started to appear on 45s in 1980, and by 1981, it was fairly universal (Living Eyes' singles had it, as did "I Can't Stand It" by Eric Clapton). My Living Eyes LP is on silver label. Guilty: It doesn't quite stack up against "A Woman In Love" but it is pleasant and I love how the pre chorus leads into the chorus. Help Me! : I can see why this one didn't do that well. If it was released two or three years earlier, it would have been a hit. By 1980, it sounded dated. Ahh, forgot all about that one! All the copies I have seen, including my Japanese obi, has it too. I wonder if that and the Stayin Alive soundtrack were their last titles? Like that song, though it really doesn’t go anywhere. They sure have a gift for melody! After the triumph of "Woman in Love," I was curious to hear what was next. At this point, I didn't own the Guilty album; I don't think I had it in the collection until the late 1980s, when I started to buy more albums commensurate with a larger income, and by then, it was easy to find used. So I experienced the songs from the album as each single came out. "Guilty" was another pleasant surprise. It was, dare I say it, restrained. Barbra Streisand and Barry Gibb mostly sang in normal voices, and they blended very well. It wasn't in the same league as "Woman in Love," but I don't think it was trying to be. In general, an excellent song. surefire melody that sounds better with each listen. The unobtrusive orchestration allows lead and harmonies to shine." Record World had "Guilty" as one of its Page 1 single reviews on November 1: "Barbra's vocal glistens like an early morning dewdrop while Barry adorns with plush harmonies on this title cut from her latest LP." In its November 1, 1980 edition, Cash Box listed "Guilty" as one of its Hits - Out of the Box on its singles review page. If you've been reading along, you may recall that "Help Me!" by Marcy Levy & Robin Gibb was in that same list at the same time. You know what else was? Several other monster hits like "Love on the Rocks" by Neil Diamond, "(Just Like) Starting Over" by John Lennon, "De Do Do Do, De Da Da Da" by the Police, and "Hungry Heart" by Bruce Springsteen, all of which also appeared in the BB and RW review page of the first of November. Folks, the competition at the end of 1980 was fierce. I can't remember the exact name of the thread here on the SHF, but the gist of it was this: "Would (Just Like) Starting Over have been a #1 hit if John Lennon had lived?" Some posters believed in the urban myth that the song was stalling, or even dropping, as of December 8, 1980. Without question, the song most negatively affected by Lennon's death was "Love on the Rocks." It managed to get to #1 in R&R, in the December 12 issue, before post-assassination airplay was a factor. But it stalled at #2 in BB, #3 in RW, and #4 in CB, all in early January 1981. In at least two of the trade papers, "Guilty" might have had a chance at the top, too. In Radio & Records, it peaked at #3 in the December 19, 1980 issue, with "Starting Over" at 1 and "Love on the Rocks" at 2. It also peaked at #3 in Billboard, on January 10 and 17, 1981, with "Starting Over" at 1 and "Love on the Rocks" at 2 both weeks. In Record World, "Guilty" peaked at #6, and in Cash Box, it stalled at #8, so the Lennon Effect didn't come into play in either of those, I don't think. Another place where it played no role was the adult contemporary charts. "Guilty" peaked at #2 in Radio & Records, #4 in Record World, and #5 in Billboard. "Guilty" (4:24) backed with the Streisand solo track "Life Story" (4:34) was released with the number Columbia 11-11390 in late October 1980, based on review dates. The "11-" prefix indicated a new list price of $1.69 for 45s. The printed matrix number for "Guilty" is ZSS 167542 and for "Life Story" is ZSS 167541. There probably is some good reason why the latter has a lower matrix number than the former, but I'd have to do far more research to find out; it's not because "Life Story" was the intended A-side, because it wasn't. It did not have a picture sleeve in the U.S. Though CBS used all three of its plants to manufacture "Guilty," only two distinct stock copy variations exist, one from Pitman/Terre Haute and one from Santa Maria. The most obvious difference: The artist and title print on the Pitman/Terre Haute copies is larger than it is on Santa Maria copies. Placement of the other credits varies as well. "Barry Gibb appears courtesy of RSO Records" is at the right on Pitman/Terre Haute pressings and at the left on Santa Maria pressings. Promos exist with "Guilty" on both sides in stereo; they came from at least Terre Haute and Santa Maria, and the Santa Maria promo was pressed on vinyl rather than styrene. As was true with "Woman in Love," excess Pitman pressings were sent overseas and issued with title-based sleeves. Some of these even had "Life Story" listed as the song's hit side. On March 3, 1981, the RIAA certified "Guilty" as a Gold single. Interestingly, this 45 was never re-certified Platinum, like "Woman in Love" was. This 45 was re-assigned to the Columbia Hall of Fame in 1989 and given a gray label with the new catalog number 13-68708. It was likely pressed at CBS Carrollton. Majk, cut to the chase, Hadean75 and 1 other person like this. "What Kind of Fool" is the title of a vocal duet from 1981 by singers Barbra Streisand and Barry Gibb. The song was written by Gibb and Albhy Galuten. The songs on the Guilty album were a collaboration between Streisand and all the members of the Bee Gees, including Barry's brothers, Robin and Maurice Gibb. But Barry Gibb played the largest role of the brothers on the album, co-writing and co-producing all of the tracks, appearing on the album cover embracing Streisand, and singing two duets with her. Co-producer Karl Richardson was quoted describing Barry Gibb's contribution to this song: "He did the demo first. Barbra sang to the demo, then he came back and replaced a couple of things after he had heard what she was doing." Released as the third single from Streisand's 1980 album Guilty, "What Kind of Fool" was the third consecutive top ten single from the album in the United States. "Woman in Love" reached number one on the Billboard Hot 100 chart, and the album's title track (also a duet between the two singers) reached number three, both in late 1980. "What Kind of Fool" spent three weeks at number ten on the Hot 100 in March and April 1981. It also spent four weeks atop the Billboard adult contemporary chart. Popular American TV serial Glee covered this song in 2011 with fictional character Blaine Anderson (as played by Darren Criss). This was featured on their soundtrack album Glee: The Music Presents the Warblers. No Glee episode had featured this version, as it only appeared in the album. Record Rotator, Jarleboy and sunspot42 like this. "Promises" is the title of a 1981 song by Barbra Streisand. The song was written by Barry Gibb and Robin Gibb, who also provide backing vocals. It was the fourth of four singles released from her album Guilty. "Promises" narrowly missed the Pop Top 40 in the U.S., peaking at number 48. However, it reached the Top 10 on the Adult Contemporary charts, reaching number eight, and number five in Canada. Jarleboy and Majk like this. "What Kind Of Fool" was more big drama from the Bee Gees. Babs was the perfect vehicle for that. Jarleboy, Bobby Morrow and cut to the chase like this. Now for me, a dreadful song after a very long run of great material. I can’t believe they thought this would be a hit. My apologies to anyone who likes it...I haven’t read the comments yet. Really, to my ears this is pretty out there to be an A side. Rick Bartlett and Castle in the air like this. Decent chorus but the rest of it, I agree it’s a bit disjointed but not bad. Maybe a bit too “Bee Gees” for people as clearly folks were tired of their sound, though I wasn’t one of them. And by then who didn’t own the album if there was interest. Four singles was probably one too many. However, what a fantastic album over all! Anyway...yes, I have to agree with you...something a bit odd about it but I wouldn’t say it’s bad, and I used to like it a lot back in the day. And yes, very ABBA sounding. Hate to say it, but I think they would probably have made it a better song, but Barbara performed it well. I think we’re critical more of the production. Jarleboy, Majk and cut to the chase like this. Promises is a fun,driving song that should have charted higher. I don`t remember that song from Andy at all,this was the first time I heard it and likely the last. It is imo a poor effort. Jarleboy, Jrr, jeffmo789 and 1 other person like this. I always loved Promises, though it’s not really a ‘single’... It’s also one of the most ‘Bee Gees’ type songs on Guilty. On the majority of the songs, Babs managed to put her own stamp on them, but on Promises she just sounds like a 4th Gee. Jarleboy, Jrr, sunspot42 and 2 others like this. I was always an Andy fan was was glad to get this on his GH album. As ever, timing is everything and had it come out 2 years earlier I think it would have been a top 10 hit. It’s not one of his best singles, but I do like ut. This is a long-winded way of saying that "Time Is Time" has vanished from the airwaves, at least in my reckoning. It wasn't a huge hit, but it did make the top 20. It deserves a better fate. It actually rocks! I enjoyed listening to it again. From what I read, it's mostly Andy's composition, and he learned well. This proved to be Andy Gibb's last Top 20 single. Another song from the Greatest Hits album would be issued, as would a final one-off in 1981, which we'll get to in due time. Billboard reviewed "Time Is Time" in its November 15, 1980 issue: "Although contained on Gibb's 'Greatest Hits' LP this is a new song that is one of the singer's better efforts. Gibb's vocal compliments the mid-tempo orchestration and effectively utilizes harmony vocals." Cash Box listed it in its Hits - Out of the Box section on its November 15 single review page. Yes, it was a hit out of the box, as it debuted reasonably high in the November 22 issues of the three trades with a Top 100 (in the 50s or 60s). But it stalled in early 1981 before making the top 10. Its best placement was the #15 peak in Billboard; it also peaked at #18 in Radio & Records, #19 in Cash Box, and #21 in Record World. On the adult contemporary charts, "Time Is Time" peaked at #25 in Radio & Records, #29 in Billboard, and #32 in Record World. "Time Is Time" backed with "I Go for You" was given the number RSO RS 1059 and released in early November 1980. The listed time for the A-side is 3:31 but is actually 3:37; it is edited by about 20 seconds from the album version and has a slightly early fade (the last sounds on it are Andy singing "give me no wrong" by himself, with no instruments thereafter). 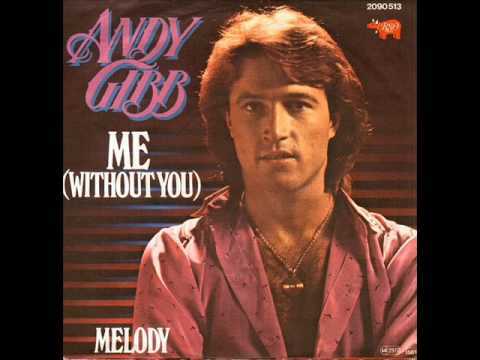 "I Go for You," which I remembered because Andy sang it at the 1979 Music for UNICEF concert, is the studio version and is listed with a time of 4:19. I can tell that RSO Records was starting to cut corners by this time. First, it didn't care if different pressing plants used its old or new labels. Second, not only did RSO rarely use picture sleeves, but by this time, it wasn't using company sleeves, either. I bought "Time Is Time" during the Christmas break of 1980-81, and my copy came in a plain white sleeve. From this point on, every silver-label RSO 45 that didn't have a picture sleeve had the most generic sleeve possible (plain white). Oh yes, "Time Is Time" did not have a U.S. picture sleeve. The Compton copies have the old tan labels and are vinyl; the other three plants have the silver labels and are styrene. Two distinctly different typefaces were used on Bestway copies. Promo copies came from PRC Compton (26) and CBS Terre Haute (73). Both plants have the listed "Time Is Time" time as 3:31 and are mono/stereo. The former used the same tan label as on stock copies, but modified the catalog number to RS 1059 DJ. They also are vinyl. The Terre Haute copies used white labels and styrene, and the catalog number is still RS 1059. Jarleboy, Majk, Jrr and 1 other person like this. I know what you mean. It can’t seem to settle on a ‘feel’. Perhaps they were going for funky but chickened out at the last minute? Jarleboy and sunspot42 like this.